A very intriguing phenomenon highlighted in the 1980s' is the syn-convergence extension that may develop in mature mountain belts during gravitational collapse. One of the most studied examples are the Himalayas and adjacent Tibetan plateau. Mechanisms of deformation inside the plateau, lateral escape, and exhumation of high grade rocks (High Himalayan Cristallines) at the plateau margin participating in crustal flow and mass redistribution, are still vividely debated. In order to explore these questions, I realised gravity-scaled analog models simulating the shortening of two adjacent lithospheres: a strong one representing the Asian craton, and a weak one representing the Tibetan plateau. The model is layered with sand (brittle crust) and silicones (lower crust and lithospheric mantle) placed on a low-viscosity material (asthenosphere). In free boundary experiments, lateral escape of the model is allowed by placing a neutral (very weak) silicone at one side (see lab section). Two syn-convergence flow regimes are distinguished, which are governed by the balance between the gravity potential and the strength of the plateau crust and the resistance of its lateral foreland. 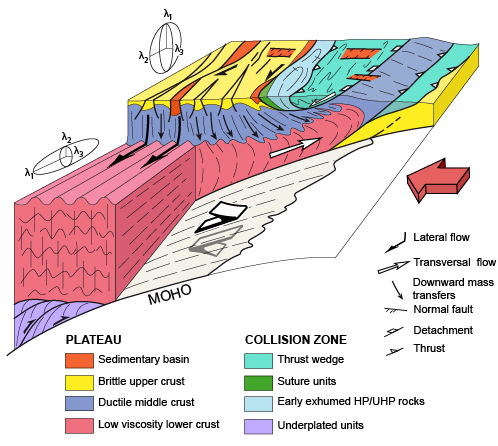 The first regime implies transversal (orogen-normal) injection of plateau lower crust into the collision zone as a result of confinement of the plateau by an increasingly stiffer lateral foreland. As a precursor mechanism to channel flow, transversal injection responds to downward thickening of the plateau crust that is forcedly extruded into the orogenic wedge. The second regime is that of collapse-driven lateral escape of the plateau. This regime is established after a threshold is attained in the inter-plate coupling in the collision zone, which allows the gravity potential of the plateau to overcome the resistance of its lateral foreland. Under the collapse-driven escape regime (orogen-parallel) such as that governing Tibet during the last 13 Ma, most of the convergent thickening of the plateau and the top and rear of the collisional wedge is transformed into lateral flow and extension. One striking feature of mountain belts worldwide is the diversity of shapes it can adopt. Most of the mountain ranges show a curvature concave toward the overriding plate (e.g. Andes, Alps, Bitlis) or straight (e.g. Pyrenees, Rockies Mountains). On the contrary, the Himalayas shows an original shape convex towards the overriding plate. The overall geometry of the range is more complex, with a large penetration of India far north into the Asian continent and two syntaxes at both east and west extremities. 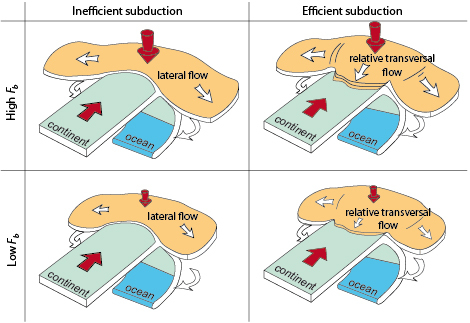 We simulated the subduction and collision between a continental upper plate and a subducting plate composed of an oceanic lithosphere and a continental indenter comparable to India-Asia configuration. The experiments reveal that the shape of the range (concave, straight or convex) and development of syntaxes are controlled by the coupling at the subduction interface, the thickness and viscosity of the upper plate and the boundary conditions. Four end-members regimes of the indentation process can be defined depending on the range shape (convex or concave) and dynamics of the upper plate (thickening or collapse). A convex range with syntaxes such as Himalayas is formed when the plates are weakly coupled, allowing overthrusting of upper plate material over the indenter during subduction and collision. Syntaxes are more pronounced for weak and thick upper plate during collapse regime and important lateral decoupling (weak lateral strike-slip faults). Rheology of the upper plate also influences the timing of syntaxes, delaying their formation.